Now that autumn is upon us, travelers can expect some wet and blustery days even in the mild Mediterranean climes of Italy. With this in mind, we asked one of our favorite Florence guides, Elvira Politi, to suggest a largely indoor itinerary for those days when plans of lingering over a cappuccino in the city’s outdoor cafés get rained out, and she came up with the wonderful Leon Battista Alberti walking tour to celebrate the recent reopening of his Rucellai Chapel. 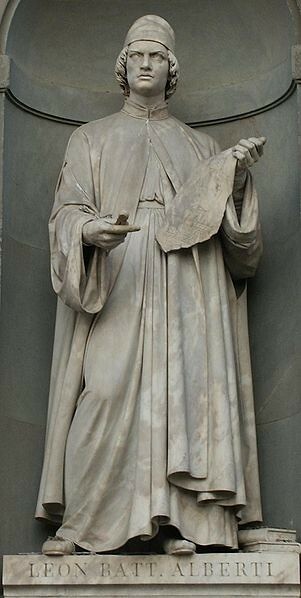 Alberti was an archetypical Renaissance man, whose talents ranged from poetry and philosophy to painting and architecture. Though he is most often remembered for his architectural works, Alberti’s contemporaries admired him more for his scholarly accomplishments—primarily in cryptography and linguistics—than his artistic ones. As a humanist, Alberti was part of a large number of Renaissance intellectuals and artists financially supported by stipends and commissions from the noble and ecclesiastical leaders of the time. Many of his commissioned works are in Florence, which was one of Italy’s most powerful and wealthy cities during the Renaissance and home to a number of powerful (and generous) noble families. A largely indoor cultural itinerary for those rainy fall days in Florence as suggested by our favorite guide! Click to tweet. The itinerary begins at the Dominican Santa Maria Novella, Florence’s first great basilica, whose upper inlaid black, green, and white marble facade was designed and completed by Alberti between 1456 and 1470 on a commission from Florentine textile merchant Giovanni di Paolo Rucellai (Alberti had already successfully designed the facade for the Rucellai Palace, which you will see later on your walk). The lower facade, an excellent example of Tuscan Gothic, had been finished roughly a century earlier, and in the succeeding hundred years the ideals of humanist architecture--proportion and classically-inspired details--became dominant. Alberti’s design, including the broad frieze and everything above, combines these ideals with a desire to maintain an aesthetic harmony with the lower facade. The pediment decorated with the Dominican solar emblem, four pilasters, and frieze are examples of classical details, whereas the large S-curved scrolls (volutes) flanking the pediment are Alberti’s own harmonious architectural innovation. From here, walk to the deconsecrated San Pancrazio church in Piazza San Pancrazio. Now a museum dedicated to one of Italy’s most influential modern sculptors, Marino Marini, the building also houses the Rucellai Chapel where Alberti’s Rucellai Sepulchre or Tempietto del Santo Sepolcro (also known as Il Sacello) was reopened to the public in February of this year. Alberti’s most prominent patron, Giovanni di Paolo Rucellai, commissioned both the family chapel and tomb around 1458. Again, the architectural elements of the chapel—large architraves supported by columns and pilasters—are classically inspired whereas the sepulchre—decorated with 30 marble intarsias reproducing naturalistic and symbolic motifs—is a triumph of humanist proportion and geometry. 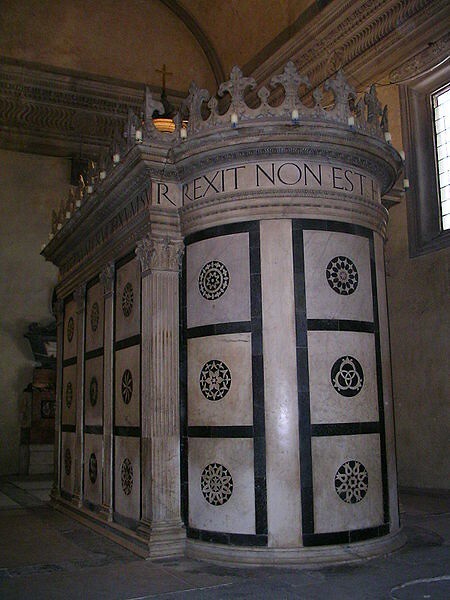 Based on the Holy Sepulchre in the Anastasis in Jerusalem, the Tempietto was completed in 1467 and contains the tombs of both the patron and members of the Rucellai family. 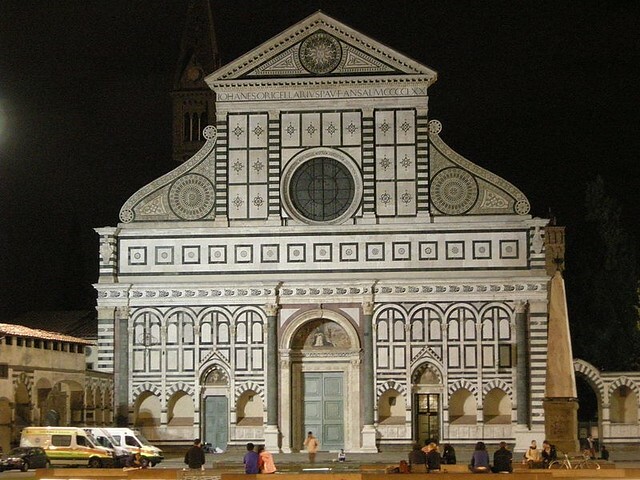 Renaissance architect Leon Battista Alberti’s Rucellai Chapel in Florence has been recently reopened to the public. Click to tweet. Follow Fossi street (taking time to browse the antique shops) to Via della Vigna Nuova and Palazzo Rucellai. Gazing at Alberti’s imposing yet harmonious facade of strictly proportional pilasters and entablatures, you can understand why he became Rucellai’s most favored architect. The wealthy textile merchant had acquired eight separate adjoining houses on this spot over a span of years in the mid-1400s and sought to unify the architectural hodge-podge (and represent his growing prominance in Florentine society, culminating in the betrothal of his son to Piero di Cosimo de' Medici's daughter in 1461, explaining the Medici devices and insignia incorporated into the design) with a single facade. The original design included eight bays has remained one short (you can still see the rough unfinished edge), as Rucellai was never managed to acquire the final neighboring house, but the overall effect is one of classical balance and refinement. It should be noted that both the attribution to Alberti and the dates of construction are disputed. 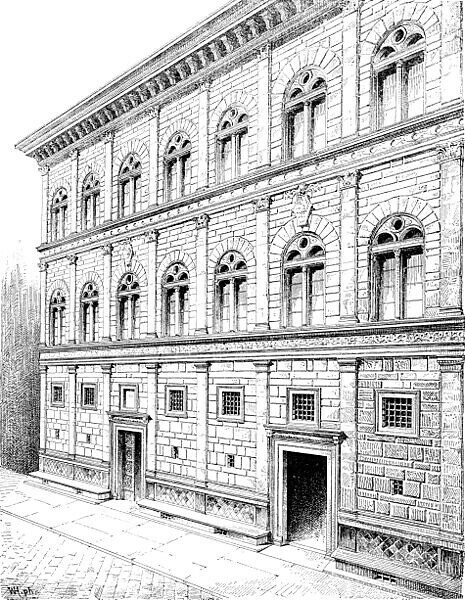 The Palazzo serves as an anchor to the triangular Piazza dei Rucellai which is also home to Alberti’s (again, disputed) Loggia de' Rucellai, which was commissioned by Rucellai for the wedding celebrations of his son Bernardo to Nannina de’ Medici in 1466. In this occasion, 500 guests were feted below the loggia and into the piazza and street in front of Palazzo Rucellai. The loggia continued to be used for the Rucellai family celebrations and weddings and as a public meeting place, though is now glazed and used as commercial space. To complete your walking tour, Elvira suggests heading to the nearby Palazzo Strozzi (another extraordinary example of Renaissance architecture) to take in one of their art exhibitions or relax with an aperitivo in the courtyard cafè (perhaps outside...weather permitting!). Raining in Florence? Duck in to Palazzo Strozzi to take in one of their art exhibitions or relax in the courtyard café. Click to tweet.